Throughout Africa, increasing numbers of people are fundamentally altering the power structure of urban centers, transforming the very nexus of these centers as government sites of socio-political stability, economic development and investment, into sites of demonstrations and demands for justice and socio-political change. African streets are not new to African protesters demanding socio-political changes. All the same, Africa is in an ‘epoch of the counter-protest state’. In the first part of this series of reflections – Post 2005 Ethiopia: EPRDF’s architecture of repression – I explore in historic perspectives (particularly with developments in Oromia regional state) the Ethiopian government’s road to becoming a counter-protest state, and proceed to discuss the systematic ways in which the regime further bolstered its role as a counter-protest state that now threatens to destabilize the country, and perhaps the Horn of Africa. “Yesterday’s Afro-pessimism and today’s Afro-optimism equally misrepresent the actual political transformations unfolding across the continent,” wrote Adam Branch and Rachariah Mapilly, in their Africa Uprising: Popular protest and Political Change. The authors argue that either perspective enforces a spurious binary: overemphasising elites to marginalize majorities of African populations. In the past decade, increasing numbers of peoples have altered the power structure of urban centers throughout Africa by making these centers the sites of demonstrations and demands for social change, taking to the so-called ‘streets’ to seek fundamental transformations in the political systems of their respective countries. Two waves of protests swept across the continent: those of the late colonial era (1950s and 60s), and those of the de- or post-colonial era (1980s and 1990s) when formal and informal economies (and combinations of the two, for example, in Nigeria) became rooted in national panoramas. Broadly, accordingly to Branch and Mapilly, the first waves seemed to bring an end to colonialism, and the second attempted to destroy the dominant architecture of one-party political systems, opening doors for multi-party systems in some countries. In countries where the idea of a central government is experienced and perceived with less primacy to daily life than in urban seats of power, the important questions are: what is ‘the street’ and where is it, and what is its role in popular protests? There appears to be an indelible link between the expansion of the ‘security state’ in Africa – in this case evolving into a counter-protest state – and a rise of new modes of popular protests that are now sweeping both urban and rural (the later previously imagined as being isolated) communities. The 2012 “Occupy Nigeria” movement was a series of socio-political protests that began as a public response to the removal of fuel subsidies by the Federal Government. Protest sites nationally included the city of Kano in the North and Ojota (part of metropolitan Lagos in the South), Abuja, and internationally, at the Nigerian High Commission in London, UK. The November 2008 protests in Jos State, Nigeria, over local election results ended after two days with the deployment of the Nigerian Army. Here in Ethiopia, urban based popular protests in 2005 that followed a disputed national election results was brutally brought down. The post 2005 era in Ethiopia marked a period when the incumbent began to undergo the most significant reorientation of its power since 1991. As was discussed in detail in Aalen and Tronvoll’s, “The 2008 Ethiopian Local Elections: The Return of Electoral Authoritarianism,” after the end of popular upheavals following the 2005 elections the regime developed “a deliberate plan in order to prevent any future large-scale protest” opposing its grip on power. “The EPRDF constructed a counter-protest state that combined a single ideological project – developmentalism – with an intensive effort at social control through a greatly expanded party,” Branch and Mapilly wrote. Subsequently, the regime in Ethiopia started to pursue two methods to build Ethiopia as a counter-protest-state. The first was to manipulate the legal system. Here the judiciary was effectively constricted into being a mere extension of the executive branch of the regime. The introduction of ‘a series of highly restrictive’ laws targeted the media, civil society organizations, NGOs and opposition political parties. It also restricted financial sources and participation in human rights issues for civil society and NGOs. The latter’s work, in particular in investigating and reporting human rights abuses was criminalized by the proclamation. In addition the draconian Anti Terrorism Proclamation effectively severed any form of dissent against the incumbent. After 2005, political opposition party members, sympathizers and leaders came under direct criticism by the regime as ‘anti-peace,’ ‘anti-development,’ ‘terrorists’ and faced charges of terrorism or treason. The result was that between 2005 and 2015, “Ethiopia has become a model of electoral authoritarianism in which manipulated multi-party elections are a means to sustain power,” according to Branch and Mapilly. That said, a lot has been said on how, nationally, the EPRDF-led regime has put in place several mechanisms that helped it silence any form of dissent. But little is mentioned on how the EPRDF built a brutal architecture of repression and bolstered its counter protest state over the last decade in Oromia, the scene of the last formidable opposition to the party’s grip in power. In the regime’s parlance it is ‘decentralization of power’ down the hierarchical administrative structures of the state. But for anyone with a critical look into Ethiopia’s politics, EPRDF began its journey into a counter-protest state with methodical, calculated rounds of federal restructuring initially under the Transitional Government of Ethiopia (TGE), 1991-1994. That journey was completed with the creation of nine federal states. But thanks to subsequent (and unrelenting) manipulations, that arrangement of decentralization of power eventually became a mere pattern of expanding the central government’s tools of control over the masses within the federated states. In 2001, the regime set in motion a second series of rounds when it launched the District Level Decentralization Program (DLDP) in the name of ‘increasing the administrative autonomy and capacity of district or Wereda administrations’. But a close look into the conduct of DLDP reveals that it was a precursor of the mechanism that eventually enabled the central government to exert unlimited control over the regional structures. The regime’s expansion of its arms of control reached a new high when, in 2006, it began constructing its socio-political framework by declaring itself a ‘developmental state’. The program necessitated the implementation of various forms of administrative and political restructuring at Kebele – the smaller unites of local government – levels. As was discussed in Rony Emmeneger et al, Decentralization to the Household: expansion and limits of state power in rural Oromia, in rural parts of Ethiopia, Kebele and its organs have been the most conspicuous incarnation of the state. Despite the regime’s parlance of “devolving” power to local governments through decentralization, a comparative study (such as Alula Pankhurst’s, Enhancing understanding of local accountability mechanisms in Ethiopia: protecting basic services project. PBS II Preparation Studies) and other studies carried out in different regional states determine that local government’s service delivery remained one of the most centralized, top-down style, strictly government controlled and party-dictated affair. The best example of boundaries that the regime blurred between the state and party structures can be seen in the creation of a door of intrusion into the daily lives of people. This can be seen from the introduction of the office of Kebele manager, an office responsible for supervision of all ‘development’ activities, which is answerable to Wereda – a de facto placement of counter power to Kebele chairmen. It is widely understood as a structure of vertical accountability. In truth therefore the official state narrative of ‘decentralization’ aimed at achieving participatory and accountable local administrations turned out to be a guise for the regime’s highly centralized party structures; a mechanism to mobilize large numbers of human resources to increase the ruling party’s ability to go deep into household levels; and spy on (and coerce) people into party membership – ultimately consolidating its mechanisms of control within each household. Looking into the case in Oromia alone, between 2006 and 2015 EPRDF has constructed sub-Kebele institutions which are by far stronger than Kebele administrations, creating a convoluted and tension-ridden social environment where the state registered and harangued members of households into party cells bearing names related to ‘development’. It was through the creation of these sub-Kebele institutions known as Gooxii (hamlet) and Garee (team or group) that the regional government enhanced the state-party controlled administrative system. Accordingly, the Kebele was divided territorially into groups of households; the Gooxii was comprised of 60-90 households, (each Gooxii consists three Garee). Each Garee brings together 20 to 30 households. The Garee was constituted by family heads, Abbaa-warraa, who reside within the Garee territory. They have been supervised and led by a committee of five whom they elected themselves. At the higher level, a Gooxii committee of five controls three Garee and binds them with Kebele, creating a channel of accountability among Garee committee, Gooxii committee and Kebele officials. Although the Oromia regional state officially dismissed the committees of Gooxii in 2008 and put Garee committees under direct control of Kebele administration ‘it continued to exist as a geographical principle of organizing the Garee,” according to Alula Pankhurst’s paper. Having achieved Kebele administration reform by establishing sub-Kebele institutions and placing them all under strict, authoritarian and highly centralized party structure, the regime quickly chained them to the older, a four-tier institutional set up (regional states, zones, wereda/district, kebele). Such is how the ruling EPRDF – using its member party the OPDO – built a new architecture of repression and control in Oromia in the name of development and decentralizing local administrations for participatory and accountable systems whose praxis was mobilizing for ‘development’. As soon as they were created Gooxii and Garee became highly politicized tools of control and repression. A number of reports by rights groups described them as strong mechanisms of suppression against political dissent. These institutions have also marshalled people for forced labor, imposed heavy fines for any absences (or even imprisoned people), called for protracted political meetings, monitored speeches, and restricted people’s freedom of movement. 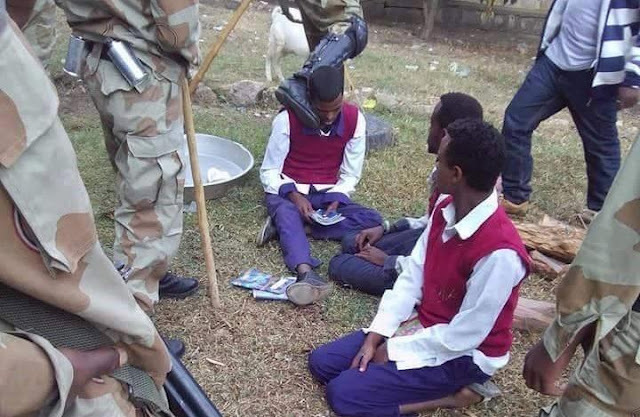 In the course of creating highly accelerated invasive mechanisms into the everyday lives of the Oromo people and their households, between 2006 and 2015 the regime has (unknowingly) helped the creation of at least two trends across the Oromia regional state. First, it fomented rising political consciousness among the Oromo people. By indoctrinating coercion into their daily lives and, through systems of control, not only did the regime expose to the people what it fears the most, but it helped them understand why. Boring, repetitive, and lengthy political meetings, close scrutiny of dissenting voices, demands for written reports from every household when guests arrive have awakened even the semi-educated Oromo youth and taught them at least two things: that there is some potential force of which the regime has been so fearful and therefore watchful, and above all the fact that support from rural communities is necessary for its legitimacy. Although the Oromo Liberation Front (OLF) since it was systematically ousted from the TGE in 1992 (and was eventually designated by Ethiopia’s parliament as a terrorist organization), has had no physical presence in Oromia in any organizational form, both the regime and the OLF itself equally insisted – for their own political gains – that the OLF has been functioning through underground political cells. (The former because OLF has been an easy, but useful tool to stifle and criminalize any Oromo dissenting voice). But despite such sinister machinations by the regime, it did not seem to have taken long before the Oromo people came to understand that they constituted the strongest force of which the regime has been so fearful. This fear was not related to opposition parties either; these parties had been denied access to the public, had most of their members imprisoned or exiled, and their offices forced to close. The regime’s fear was directly related to the rising, ever-growing, and coherently progressing Oromo nationalism centerd in the strong identity of the Oromo nation: Oromumaa (Oromoness). Second, through its intrusive mechanisms of repression, and unwillingness to give even small breathing space for the politically conscious nationalists, (even when their voices were seemingly subdued), EPRDF took public grievances to highest level, converting the conditions under which the youth in rural Oromia became ready to look for alternative political forces. Oromo peasants and urban dwellers that were fatigued with EPRDF rule began to seek alternative ways of political mobilization, especially during election campaigns. This latter case is evidenced in the run up to the 2015 national election. The only home-based Oromo opposition political party, the Oromo Federalist Congress (OFC), was able to mobilize hundreds of thousands of people despite the fact that it was denied access to the people and almost all of its offices in the region had been closed in the preceding years. The regime’s intent to rule through climate of fear ushered in an Oromo political awareness capable of striking at the regime’s lack of legitimacy. In Oromia region, access to state services, employment, promotion in civil service, opportunities of further education, prospects of graduate and postgraduate studies, chances to secure urban land and any form of business licenses have long become highly dependent on party membership. Non-OPDO/EPRDF members in rural towns and urban centers have scant chance of benefitting from any advantages related to these opportunities. At the same time, opposition members and sympathizers, and even highly critical individuals who had been denied access to lots of opportunities were invited into membership. The rank and file membership of OPDO dramatically swelled in the post 2005 period. This is one example of a central government’s attempt to apply a national framework to a street that has neither experienced nor perceived a credible socio-political framework – save for repression and abuses. But in recent months the same street became the “Oromo Street”, derailing Africa’s biggest counter-protest state. Taking the recent #OromoProtests as a point of departure, the second part of this series explores a more recent surge of popular protests, the socio-political architecture in which #OromoProtests first took shape.